Zeno D’Agostino is the President of Port System Authority of the Eastern Adriatic Sea – Port of Trieste from 9 November 2016. From April 2017 he is the Chairman of “Assoporti”, the association of the Italian Port Authorities. Currently, Mr. D’Agostino is also member of the board of Special Company for the Port of Monfalcone and President of the Trieste Passenger Terminal (TTP). He has been involved in numerous research projects in transport economics, logistics, sustainable transport, promotion and demand growth. Mr. D’Agostino has significant experience in intermodal freight transport, railway operation, international port development projects, PPP, financial investment, logistic centers and Free Zones projects. He has a background in teaching and training, he is Professor of Logistics and Transport at the master ELEO “Economics and East European Languages” Ca’ Fosfari headquarters of Treviso. 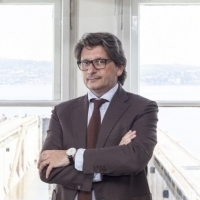 Moreover, he was General Secretary of Naples Port Authority, CEO LOGICA scarl, Agency of the Region of Campania for the promotion and research in logistics and freight, and Responsible for strategy, development and marketing Consorzio ZAI - Interporto of Verona.